We quite enjoyed seeing all your Pifast results last week - thank you to all those who took part - but it was clear that AMD users weren't having as much fun as the others. Different benchmarks paint a different picture, and for this week we're potentially turning the tables by putting the spotlight on Cinebench. The free-to-download and cross-platform test is based on Maxon's Cinema 4D and uses all available processor cores to render a 3D scene containing more than 300,000 polygons with various lighting effects. It is in our estimation an excellent indicator of a system's multi-core credentials, and we reckon a score of over 1,000 points helps identify a particularly fast machine. Our overclocked Core i7-8700K test platform scores 1,583 (pictured above), but today's best many-core CPUs can break the 3,000-point barrier. It's a quick and easy test to run, with no installation required. 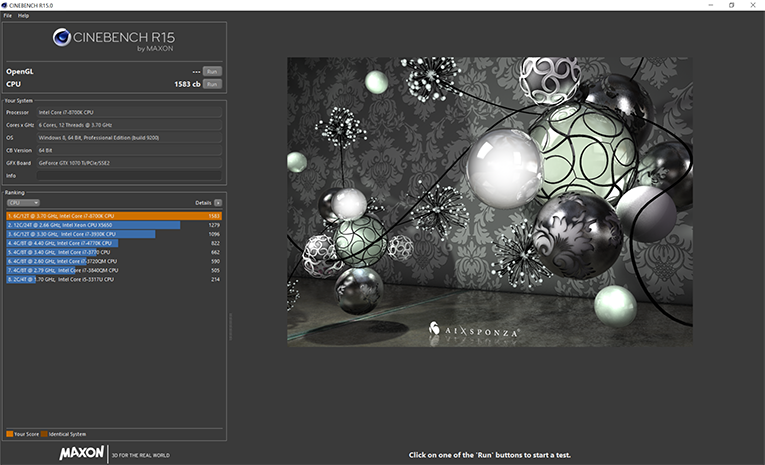 To get in on the action, download Cinebench using the link below, extract the files, launch the application and run the CPU test. Let us know which chip you're using as well as your score, and remember, higher is better. 0.2, it takes me hours to colour all those bits in by hand.